Travel back to medieval times for a chance to become a brave knight that will slay the dragon in order to protect his castle. Click here to play! If you're successful in this fantasy adventure you'll easily win plenty of money. Your princess is your number one priority. Keep your lady safe by spinning her across the reels. If you can get two to five of her across an active pay line, you'll get up to 2000 times your line bet. You may also want to seek out the help of other knights. Spin two to five of these brave men and you'll get up to 10000 times your line bet. You'll get up to 1000 times your line bet if you can spin two to five castles. There are plenty of other symbols to help you in your quest, including armor and swords. Keep your eyes peeled for the fearsome, fire breathing dragon. You'll want to slay this creature by spinning him across the reels. He acts as a scatter that will bring in up to 500 times your total bet. He will also trigger a bonus feature if you get three or more anywhere on the board. See if you can survive this medieval adventure. 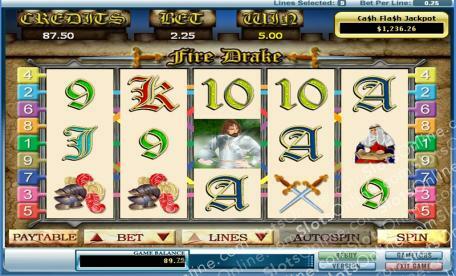 Slay the dragon to save the day and win treasures beyond belief! The fire breathing dragon acts as a scatter. If you spin two to five anywhere on the board and you will get up to 500 times your total bet. Spin three or more anywhere on the board and you will trigger a bonus feature. If you spin three or more of the fearsome dragon and you will trigger the Fire Drake's Lair bonus feature. During this game, you will have to choose three items from the dragon's lair. Each item you reveal will reward you with a number of free spins. Win up to 100 free spins in this bonus feature.